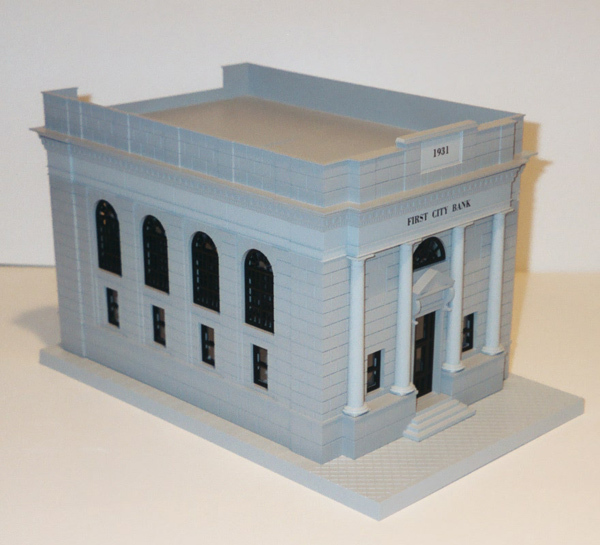 Here is my kitbash of four MTH bank buildings into a city station. 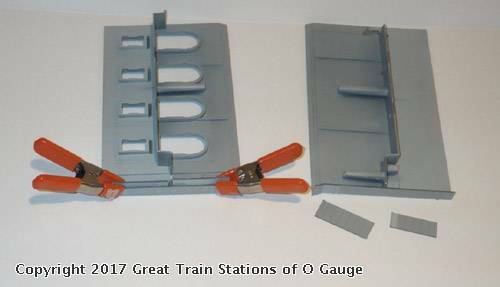 I know others have turned MTH banks into a station, but I wanted a certain look that required a bit of surgery. 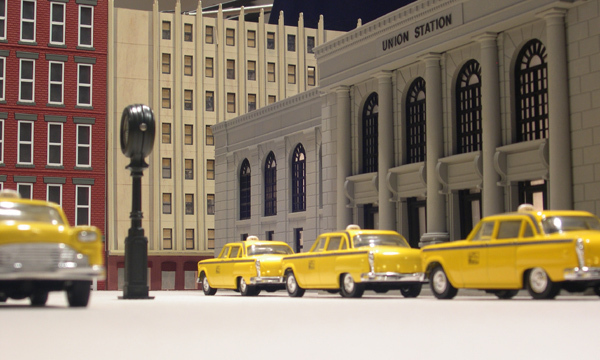 First, I wanted to give the impression of a big city station, but without taking up too much space. I created that look by making the wings sections narrower and shorter than the center section. 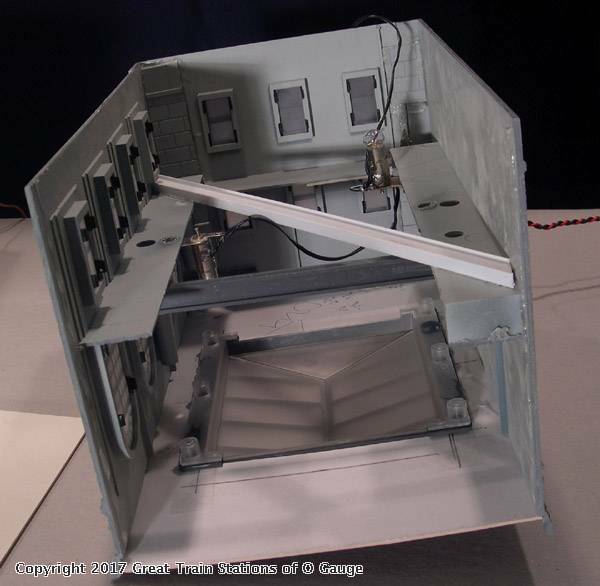 The overall footprint of the building is 34" long x 9" wide x 7 1/2" high. The wings are 11" long x 7" wide. First, I eliminated the part of the side walls that extends past the roof. 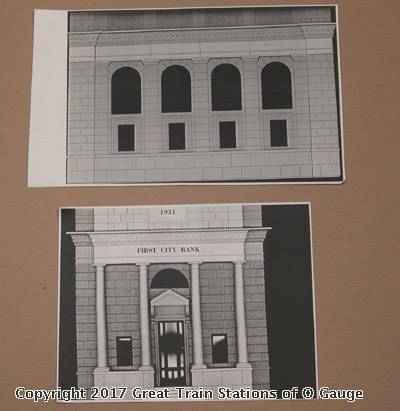 That is an architecturally bombastic detail that is more appropriate for a Russian government building than a US train station. 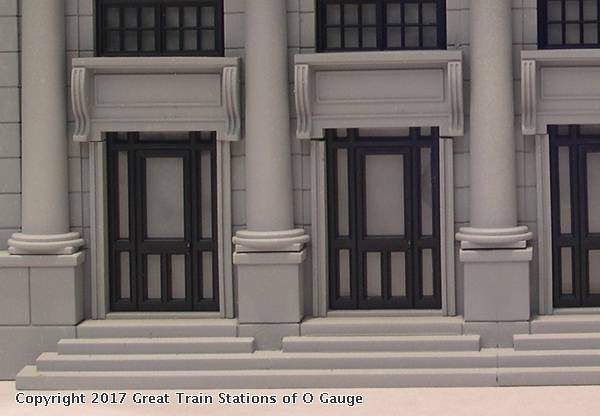 Second, I eliminated the pointed cap above the center door. It just doesn't go with the rounded windows. And third, there are far few entrance doors in the MTH bank for that sized building. So I made the number of doors match the number of windows in the center section in order to give the impression of a busy city station. You can then cut and paste sections to make a full size mockup of your pending masterpiece. This is good technique for visualizing the final building and saves a lot of time and "do overs". This is straightforward, but I did need a punch to remove the columns. Note the straightedge (in this case a steel ruler) is on the side you want to keep. That way if the saw slips you won't hurt anything. Or at least not anything on the building..I did go through a box of band aids during this project! I also went through three saws. 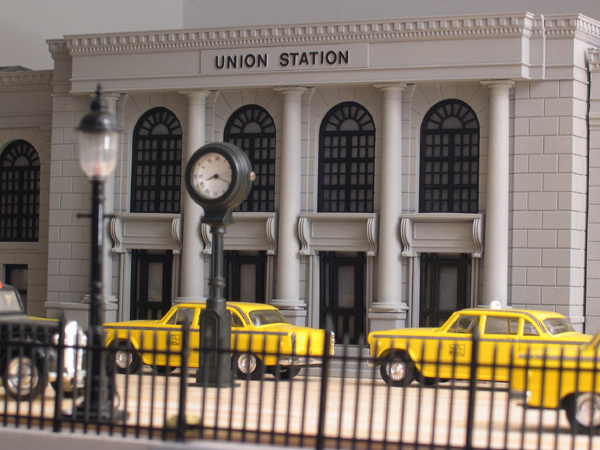 Like I said, MTH makes tough buildings. The roofs are colored coarse texture mat board, lightly dusted with gray primer. 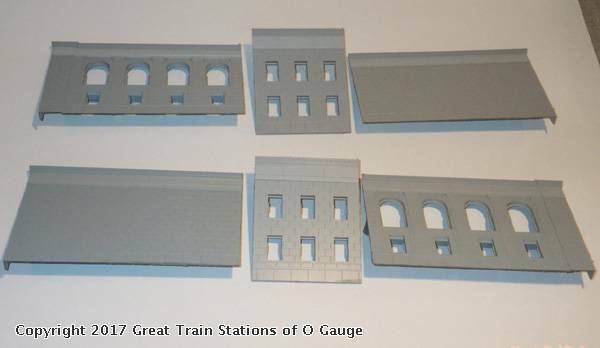 The skylights are form the MTH operating gas station, with the "glass" painted with Testors Dull coat to make them opaque. 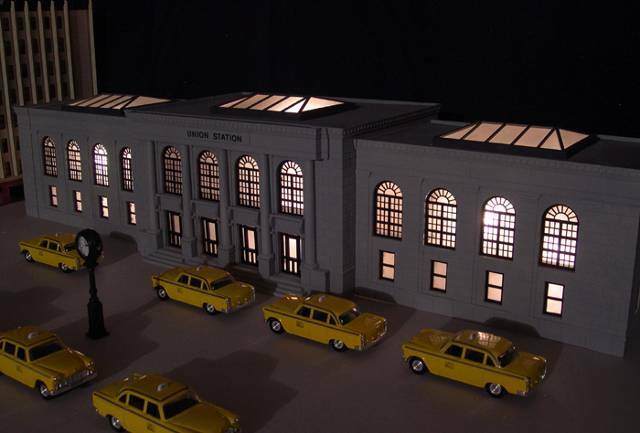 The skylights are from the MTH operating gas station. 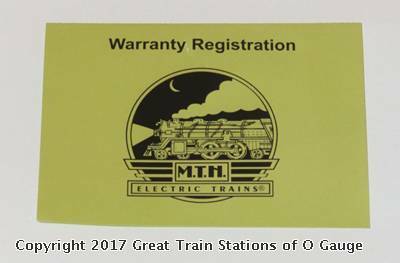 At $24.00 each they were not cheap, but after exhausting several options (GRandt Line, DPM, Pecos River, making my own) I finally threw in the towel and ordered the MTH ones. John - this is an excellent station! 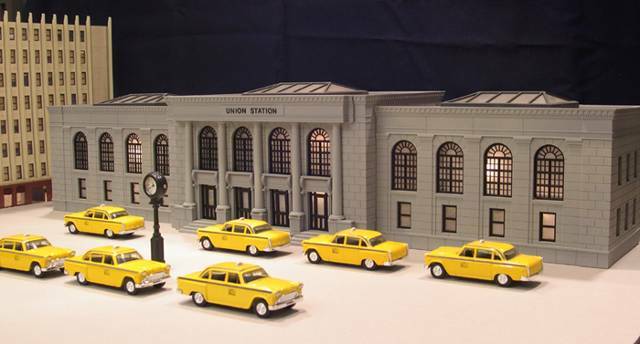 It very much gives the sense of a large, urban station, and is a magnificent centerpiece to your spectacular layout. Thanks for the in-depth build instructions - this is a great project! Man, that's nice! 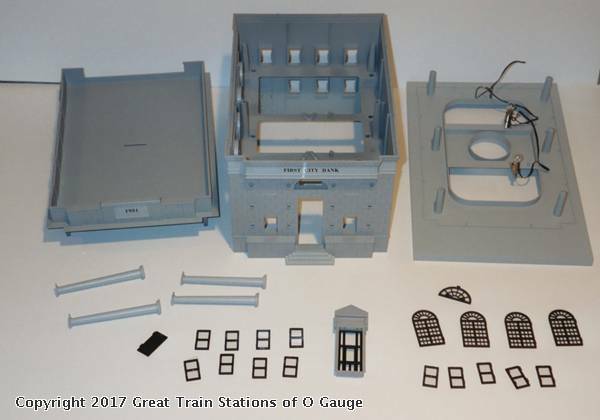 I swear I just looked at the MTH bank building today online (KB hobby having a sale) and thought that would make a nice station, and when I saw your pics elsewhere on this forum it really reminded me of it, and now I have read what you did with 4 of them! That's great. I may be copying your idea in the future because I love the look of your station. I realize this is an old post but I have finally decided to go the 4 banks to 1 station route. I have 3 banks on hand and my LHS is getting the fourth as soon as he gets an order together. My problem is that apparently the photos here are no longer supported due to some sort of changes either on the site or here on my own computer. Who knows? 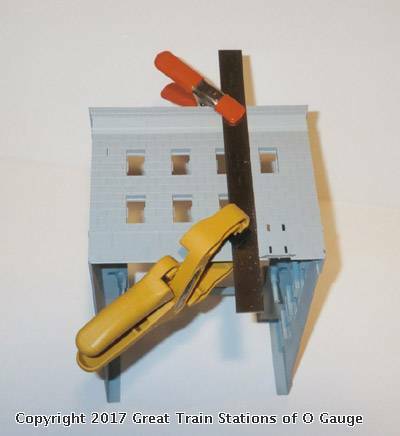 The modular guys at this past York had a 4 banks to 1 station on their layout and they had enough material left for a nice additional structure. I talked some to the guy who built it and he was helpful. I suppose I could stare at the pictures I took at York but it would be really nice if this post could be "resurrected" to it's original state. Any hope of that happening? Great to hear Charlie, and hope you'll share with us your progress. Yeah it's too bad about the photos now gone - they are unfortunately hosted elsewhere (not uploaded to the J&Cindy Studios site), so we can't do anything to make them appear. But I will reach out to John Sethian and see if he can either get them back online, or better yet upload them here.